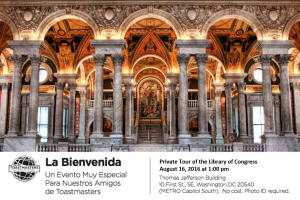 Special Events – Toastmasters 2016 International Convention – Washington D.C. Cost: $10.00 for reception and open mic. 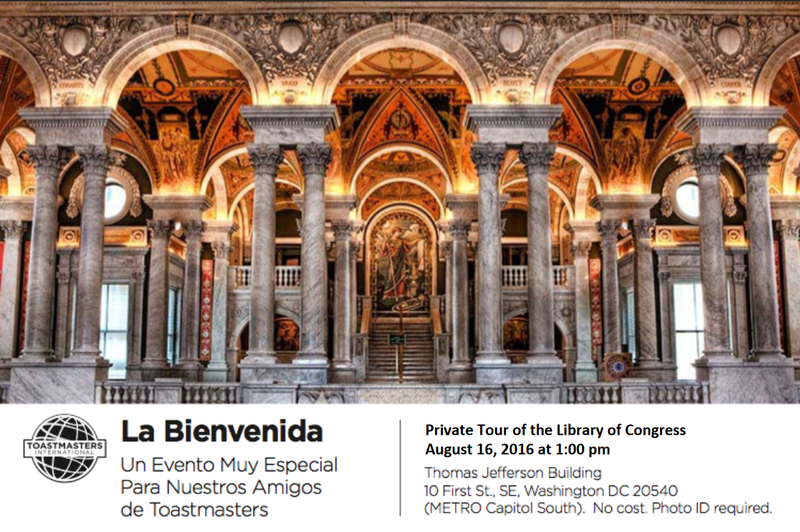 Thomas Jefferson Bldg. 10 First Street, SE, Washington, DC. No cost. Photo ID required. Welcome to Washington DC!!! 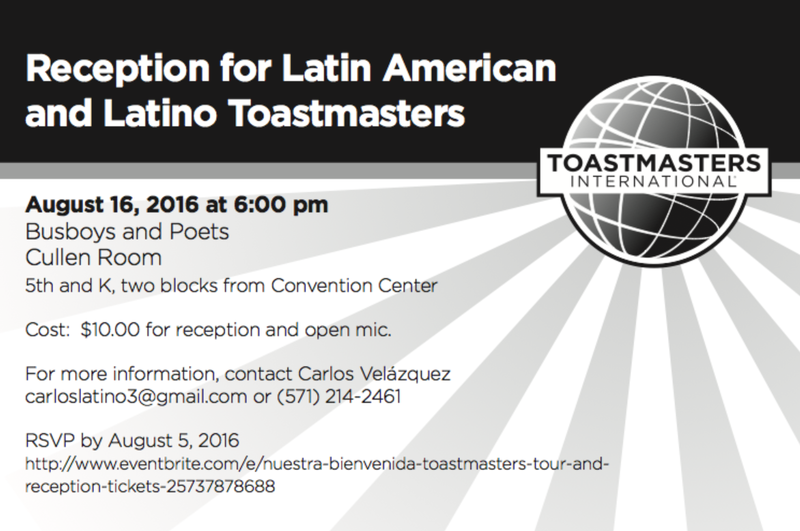 A number of the local Toastmasters Clubs have arranged a special event, which we invite you to attend. It’s an Evening with Kelly Sargeant: https://www.youtube.com/watch?v=_v5zyciV-9c. Kelly Sargeant, http://www.kellysargeant.com/, placed third in the 2014 World Championship of Public Speaking at the Kuala Lumpur, Malaysia International Convention. She is now on the public speaking circuit to Toastmasters and is in heavy demand to both corporate and community groups around the world. 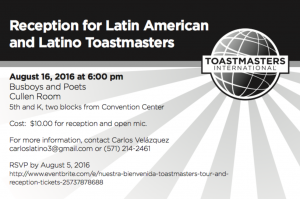 On Tuesday night, 16 August 2016, 7-8 p.m., we have arranged a nighttime event at the Crowne Plaza National Airport (CPNA) in Crystal City, Arlington, Virginia, for Kelly to speak to both Toastmasters and non-Toastmasters audiences, on both empowerment and achievement. After Kelly speaks, there will be a “Back in the Day Disco Party,” which will allow you to get your groove on, prior to the start of the Convention. The Crowne Plaza National Airport, 1480 Crystal Drive, Arlington, VA 22202, is just two blocks above ground or underground from the Crystal City Metro Station on the Yellow Line; six stops south from the Mount Vernon Metro Station). While there is a charge for parking in the Hotel Parking Garage, free parking is available less than two blocks from the Hotel in one of the Crystal City (P) parking garages at 1550 and/or 1750 Crystal Drive. The Crowne Plaza National Airport is right off I-395 and Route 1 (Jefferson Davis Highway) in Crystal City/Arlington, Virginia. So it’s user friendly for attendees who choose to drive to the event. 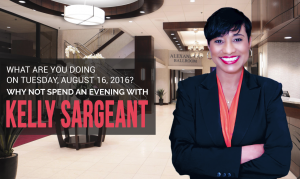 So put a glide in your stride and a dip in your hip and head down to the Crowne Plaza National Airport to see the one and only Kelly Sargeant on 16 August, at 7 p.m., and then party until midnight at the Back in the Day Disco. You can register for the event at: https://kellysargeantevent.eventbrite.com. The meeting is a speechathon with six speeches: Two Japanese and two American speakers, plus the District 76 (Japan) champion will present both her semi-final and final speeches, with a round-robin evaluation for each.